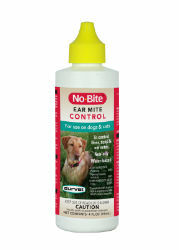 To be used as an aid in eliminating ear mites and ticks in the ears of cats and dogs and for the relief from itching caused by such conditions. Controls fleas, ticks and ear mites. Non-oily, water-based formula. Squeeze bottle with tip for easy and convenient application.